By Terry Hippy Chic Summer Collection 2018 is all about the bohemian glamour of Ibiza, with 70s summer vibes reimaged and designed into a chic and effortless collection, which sees vibrant shades capturing dazzling sunsets and electro music beats. Channeling Ibiza’s bright atmosphere, the collection celebrates the island’s paradisiacal beauty and carefree, hippy spirit. 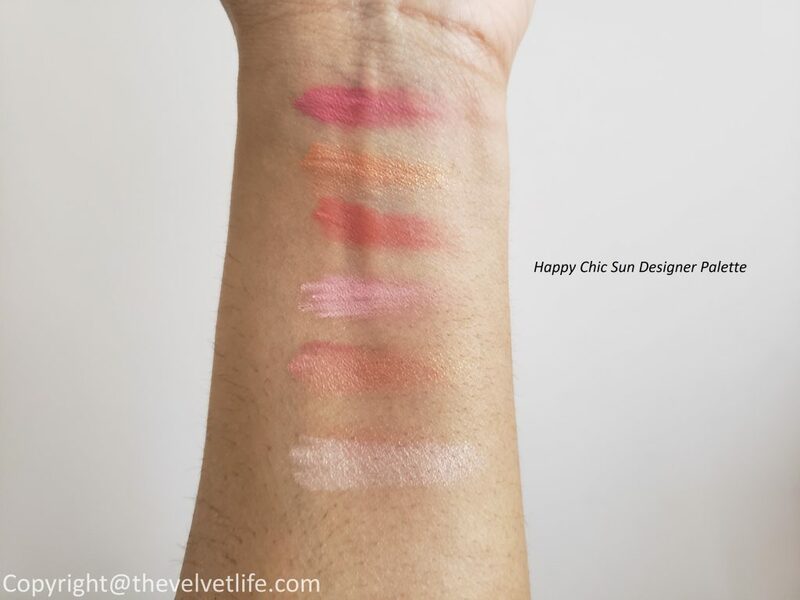 I am reviewing the By Terry Hippy Chic Summer Collection 2018 which includes By Terry Sun Designer Palettes – Happy Chic and Happy Sun, and By Terry Twist-On Lip Dual Lipstick in 8 shades. The ultimate makeup kit essential, the bestselling sun designer palette is here in two beautiful editions. There are two addictive harmonies which have been created to give an all-over, radiant, sun-kissed look for both fair and tanned complexions. 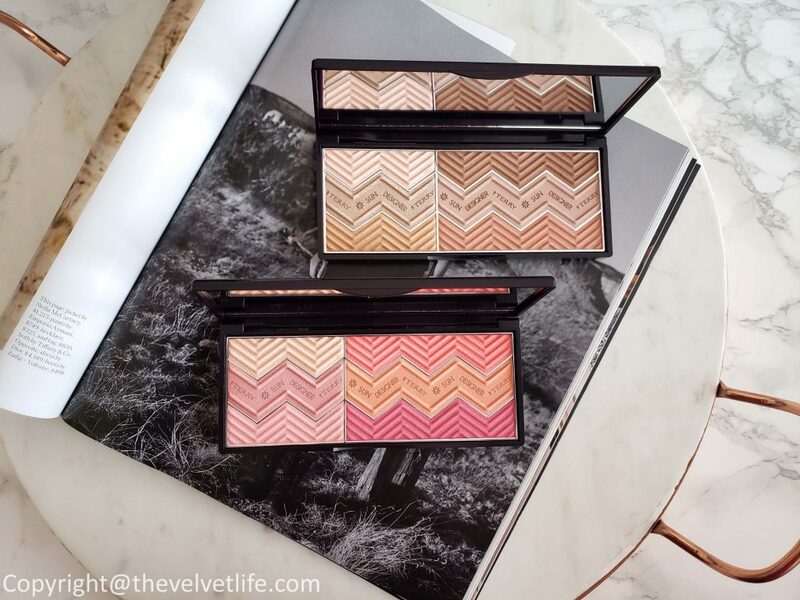 Both the hybrid palettes feature six elegant and sparkling shades, playing the roles of bronzer, blush, and highlighter, which work to enhance the skin’s overall appearance. 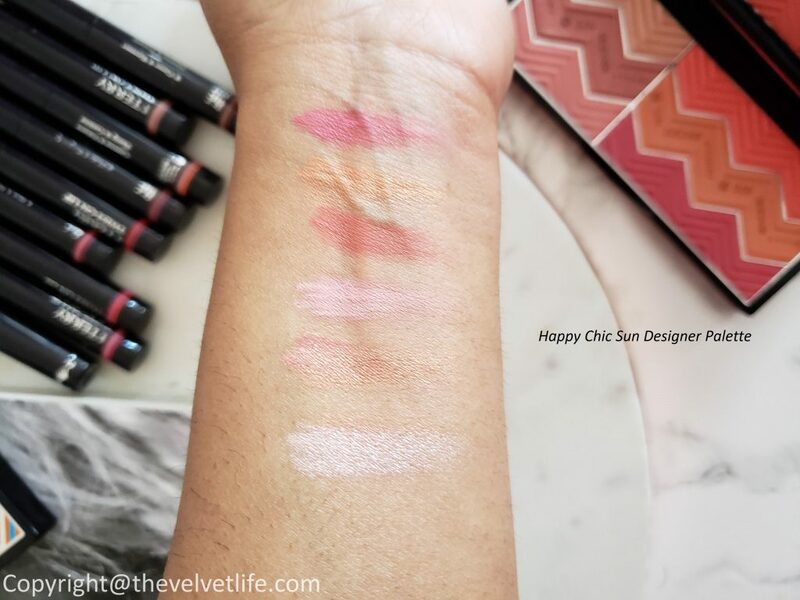 Happy Chic is a blush focussed palette with pearly pink highlight, radiant peachy pink blush, matte pale pink, glowing coral blush, shimmery beige, matte fuchsia shades. 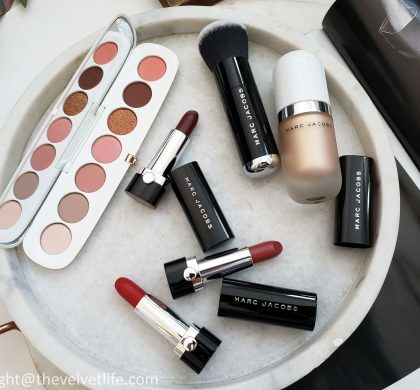 For a warm, sunny complexion, apply the blush shades (right hand side of the palette) to the cheekbones before applying the shimmery shades (left hand side of the palette) to the key areas of the face, including the higher cheekbones, eyebrow bone and bridge of the nose, using an angled blush brush. For a healthy glow, blend the shiny and matte shades together and apply to the cheekbones using the angled blush brush. 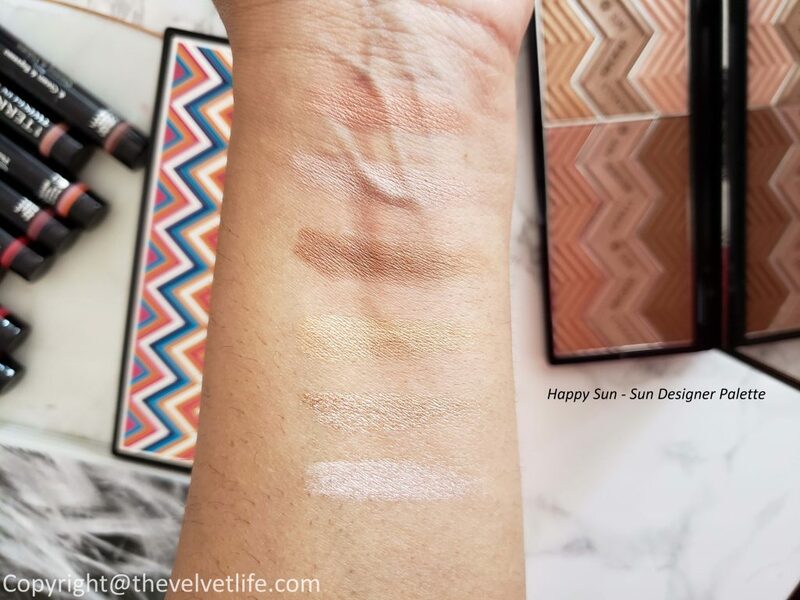 Happy Sun is a bronzer focussed palette with champagne beige highlighter, luminous tan highlighter, glowing beige highlighter, matte brown contour/bronzer, matte cafe au lait shade, and matte peachy coral tan tone shades. For an all-over bronzed, matte finish, blend the three shades on the right-hand side of the palette together using a powder brush or a kabuki brush focusing on key areas including the forehead, cheekbones, chin, and neck. 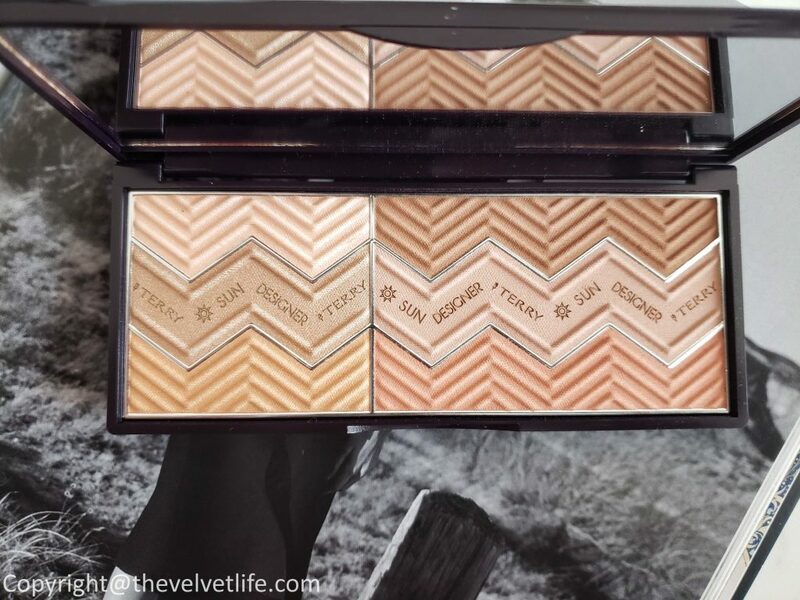 For a glamorous and dewy finish, apply the shinier shades on the left-hand side of the palette to the key areas of the face, including the higher cheekbones, bridge of the nose and eyebrow bone. 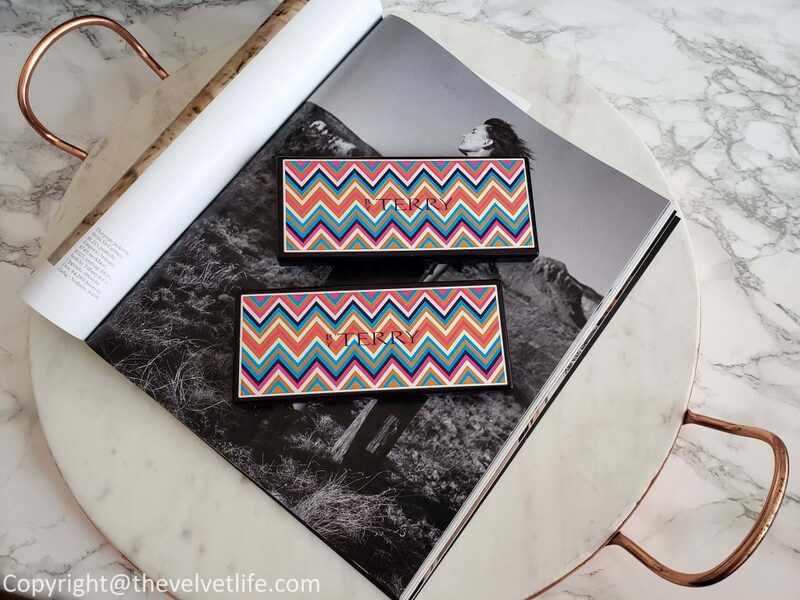 Both the palettes are housed in streamlined chevron emblazoned compacts with a generously sized mirror. I am absolutely in love with the Sun Designer Palette’s, the powder is very finely milled, pigmented, and blends in so nicely into the skin. 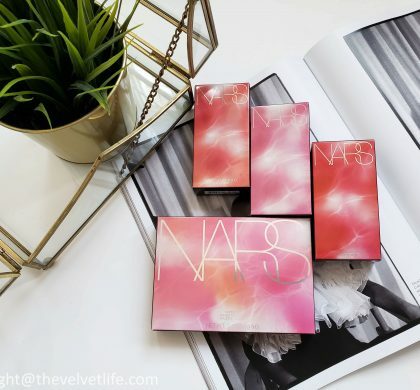 Each palette is perfect for creating a full face look. 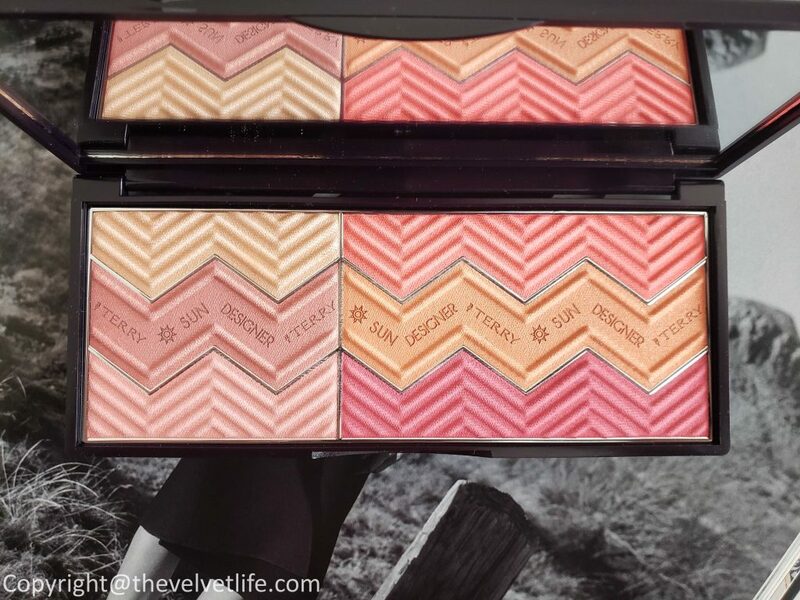 Happy chic palette – from the highlighter to the blush shades, from the matte shades to the radiant and shimmery shades, they all blend in perfectly to give a beautiful lit-from-within glow and flush. 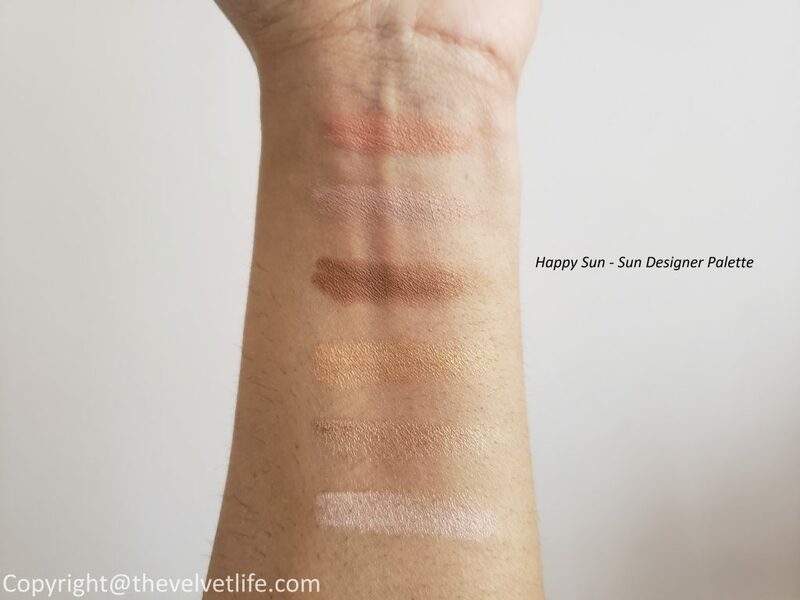 Happy Sun palette is perfect for the sun-kissed look with the most natural and radiant warmth. By Terry Twist-On Lip Dual Lipstick – plump & volume is an innovative and ultra-intuitive twist and design dual lipstick, it creates the most beautiful plump & contour for the perfect gradient lip effect. The formula is highly concentrated in sheer and intense premium pigments, its glossy-glam formula reveals sensual, shiny lips. 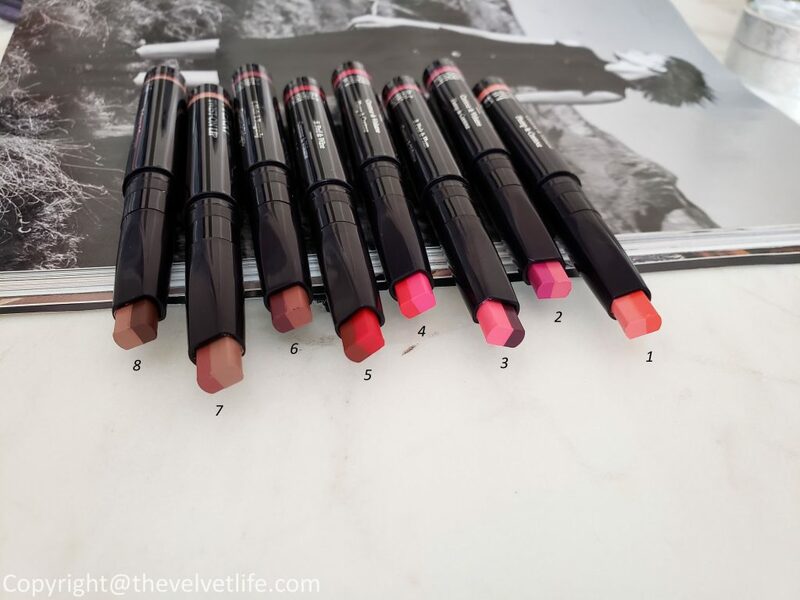 By Terry Twist-On Lip Dual Lipstick is available in eight vibrant, bi-chromatic shades – a subtle association of large light shade to fill in and think dark shade to contour. Ombre – To create a full ombre effect, apply the darker shade on the border of the lips, followed by the lighter shade in the center for a beautiful plumped-up appearance. Pinch the lips to melt the two colors. Or To create your own signature look, apply the lighter shade on the border of the lips and the darker shade in the center. 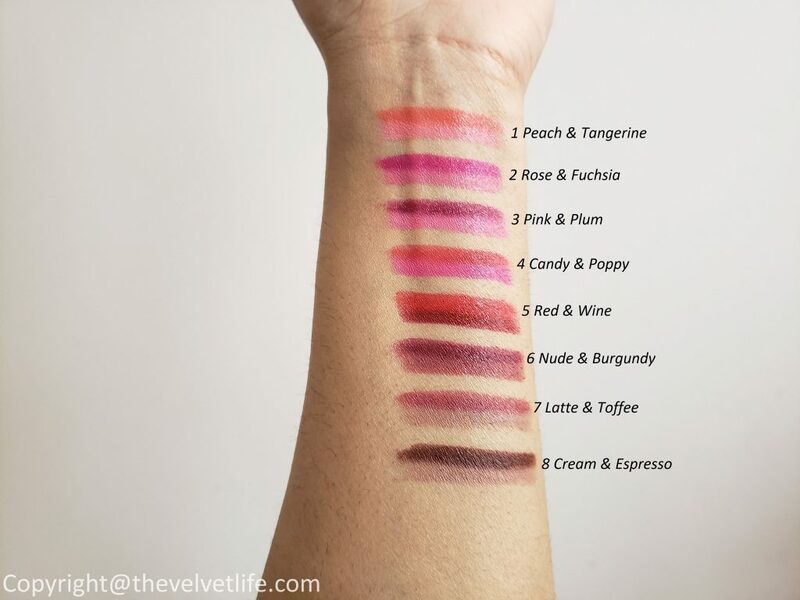 The twist on dual lipsticks are really smooth and buttery, they glide on nicely on the lips. 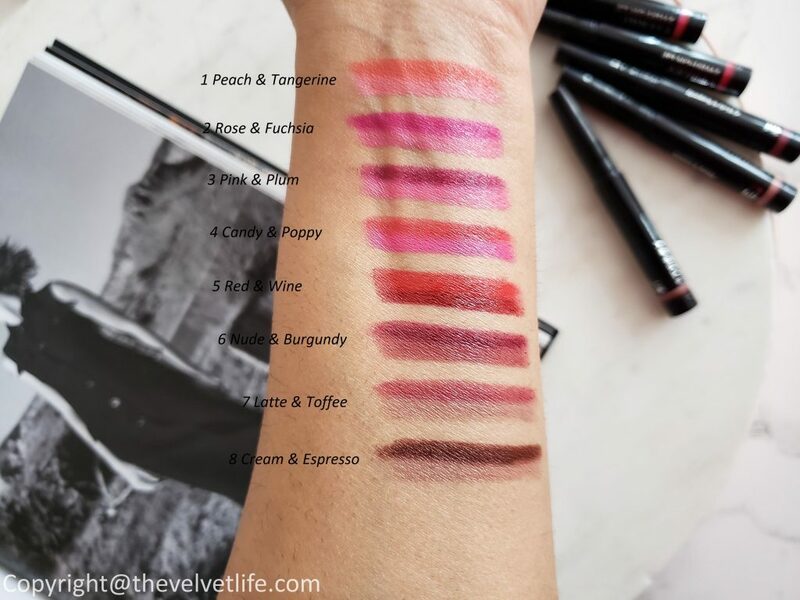 Very comfortable to wear and the shades are so beautifully chosen in each dual lipstick and they blend nicely with each other to give a gorgeous ombre effect. 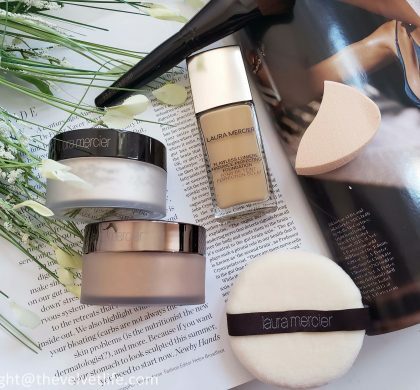 When using as a mono or duo applications, they are easy to apply, the combinations are just perfect for most of the skin tones. 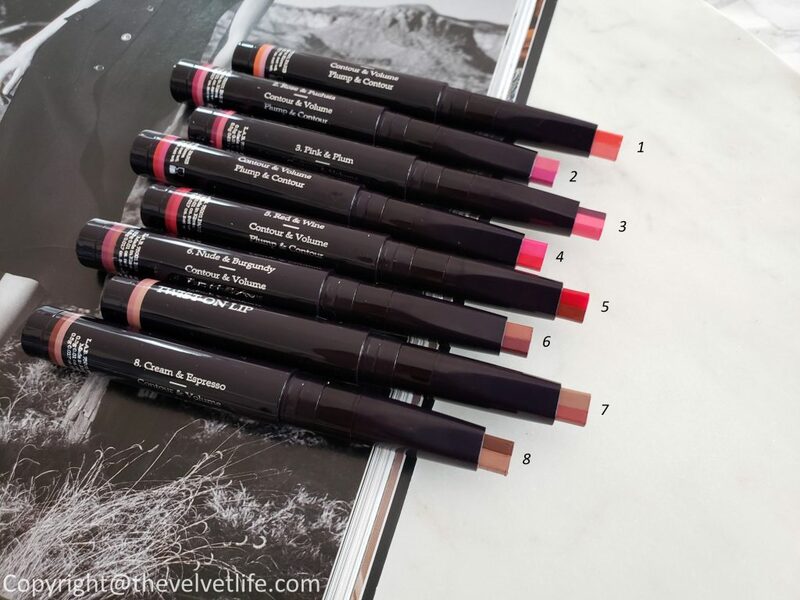 They do not make the lips look flat but give a lush voluminous finish. They are hydrating and do not dry the lips. 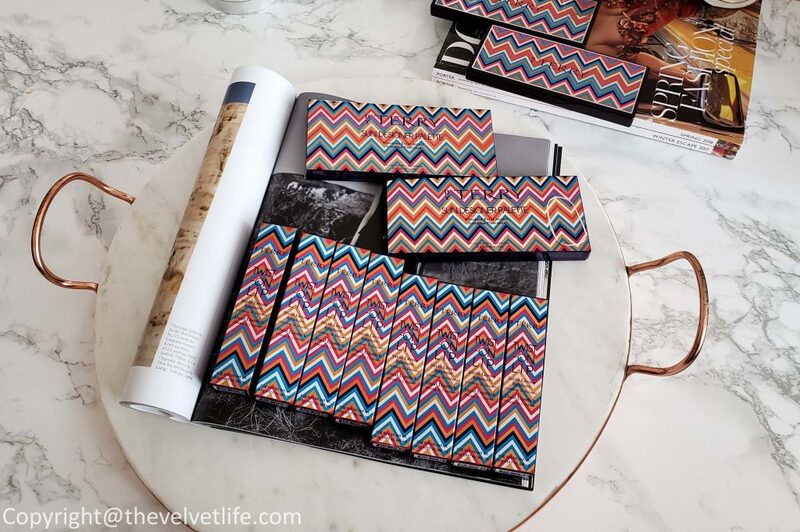 Overall, a collection worth checking out, the sun designer palettes are absolutely a piece of art and it performs great, the Twist on dual lipstick is my new go-to, very comfortable to wear and shade range is great. By Terry Hippy Chic Summer Collection 2018 is available at Nordstrom, SpaceNK, Saks Fifth Avenue, Barneys, Netaporter, Neiman Marcus, and Beautylish. Please make note that all the products in this collection are limited edition, so do not wait long as they do sell out pretty quickly.